Order the CD now at Amazon.com! Update: as of 2016, Science Fair has generated over $20,000 in donations to Girls Inc.! 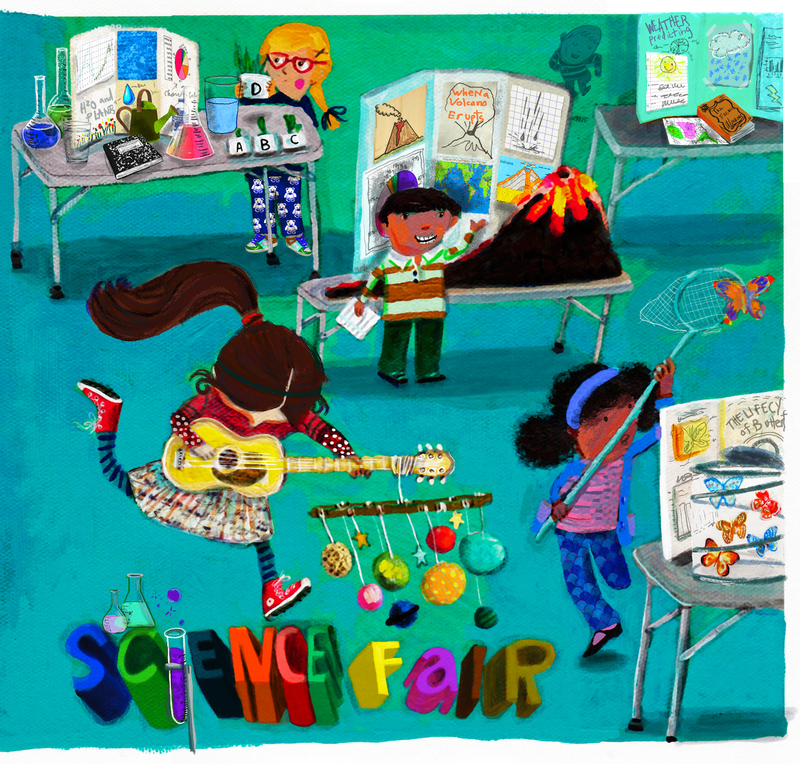 On July 3, 2012, Spare the Rock Records released Science Fair, eighteen exclusive tracks — all sung by women and girls — themed around and benefiting science and engineering education for girls. The album features new music from artists including Mates of State, Laura Veirs, Moona Luna (Pistolera‘s kids’ music incarnation), Elizabeth Mitchell, Frances England, Wunmi, Babe the Blue Ox, and many more. Extensive research shows that girls, from rural areas to the suburbs to the inner cities, aren’t getting the foundational education they need to get into science fields when they grow up. The same research shows that girls — especially girls of color — are persistently given the message — explicitly or implicitly — that they can’t do science. As women are significantly underrepresented in science-related fields, Science Fair will be part of changing that, both through the message of the record itself (featuring all songs sung by women) and through the financial contributions it will generate, supporting programs that improve girls’ science education. Science Fair is the second release from Spare the Rock Records. In 2010, in response to the devastating earthquake in Haiti, the label released Many Hands: Family Music for Haiti, a benefit for the Haitian People’s Support Project. Many Hands brought together nearly two dozen artists, including Dan Zanes, Pete Seeger, They Might Be Giants, Elizabeth Mitchell, Jonathan Coulton, Lunch Money, and many more. Many Hands was named the best family music release of 2010 by Amazon and other sources, and has raised nearly $100,000 for Haitian relief. Science Fair is co-produced by Elizabeth Mitchell, Molly Ledford (Lunch Money), Dean Jones (Dog on Fleas), and Bill Childs (owner of Spare the Rock Records). Cover art was donated by El Lohse (http://artbyel.com). Songs cover myriad subjects, from Marie Curie to butterflies to the Heisenberg Uncertainty Principle. As with Many Hands, net proceeds will be donated, with Girls Inc.’s science education program the beneficiary. The release is available in physical form (distributed by E1) and digitally (at all the usual places). The record’s concept was inspired by the lives of Ves and Holly Childs, Bill’s parents. Read more about the history of the release here. Lori Henriques – Heisenberg’s Aha! Ashley Albert – The Science Fair. Lyrics for many of the songs are available here. PR Contact: Stephanie Mayers, stephanie@sparetherock.com, 347-735-0736. Thanks to all of the new inspiration from Dog on Fleas, Lori Henriques, Gustaver Yellowgold, Laurie Berkner, The Pop Ups, Under the Tree Music, the artists at Kindiefest, Spare the Rock Spoil the Child, Out With the Kids, Zooglobble, Ages 3 and Up and WXPN Kids Corner. I’m excited to see how everyone’s programs and projects evolve. And thanks to the Chesapeake Children’s Museum for the tireless energy to give a genuine positive attitude the all of the community. This is Saki aka MC Fireworks’ first solo track! What a banger! Papa is proud. Thank you to all the above for being a part of my music and supporting me to get a song from my heart out into the world.